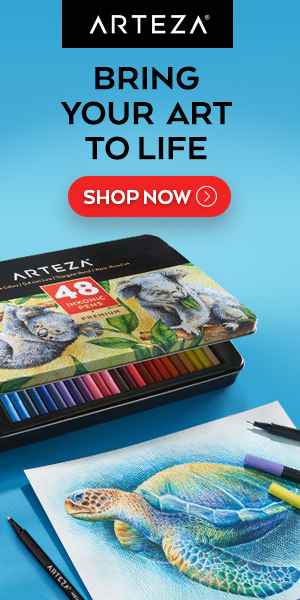 When I first saw Thomas Paquette’s small gouache paintings on the web a couple of years ago, my initial thought was that I wanted to see them bigger. I didn’t realize at the time that I was looking at them almost life size. His gouache paintings (image above, bottom row) tend to be quite small, in the range of 2×3 inches (5x8cm), even smaller than the postcard size paintings that are becoming more common with the advent of the “painting a day” phenomenon. Even so they feel remarkably rich and detailed; not in the sort of forced or artificial detail sometimes found in miniatures, but more like sketchbook paintings that have been fully realized. The size and shape of them, once I knew how small they were, seemed oddly familiar. I eventually realized that they are of similar size and proportion to many small etchings I’ve seen. The etching comparison is an interesting one, in that Paquette’s paintings deal with line, but in an oblique way. He doesn’t actually use drawn line in the paintings, as many artists will do, but his areas of color are often discreet and sharply defined, sometimes with a dark edge that forms a line against another color. 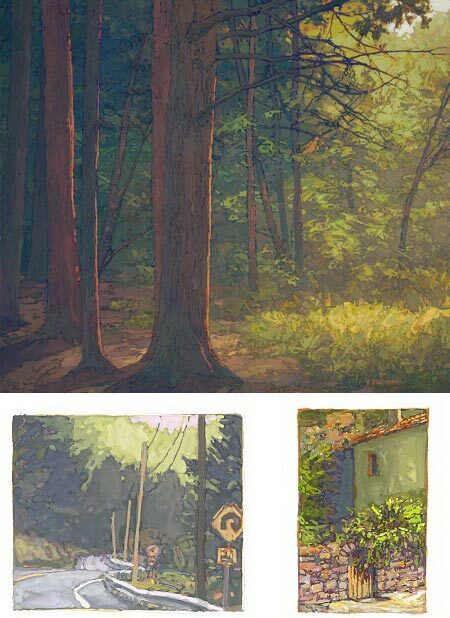 That characteristic of highly defined edges of color, which may be a natural extension of the flat color areas for for which gouache is noted, has been carried over and developed in Paquette’s larger works in oil (image above, top). The result is a painting style that has some of the intensity and rich color of impressionist technique, blended with the visual charm of the line and color combinations of Japanese woodblock prints or certain styles of illustration. I missed my chance to see Paquette’s work in person the last time he had a solo show here in Philadelphia, so I was glad I caught the recent American Arcadia group show at the Gross McCleaf Gallery (also featured in the current issue of American Art Collector). This show didn’t feature any of his small gouache paintings, but I had the chance to see several of his oils, large and small. It may just be because I had so recently been to see the Daniel Garber show at the Academy, but I couldn’t help but see a comparison, particularly in the surface of the paint. Close up the texture and appearance of the paint on the canvas, in both Paquette’s and Garber’s work, reminds me of the rough mounds of oil paint, rich with the physical sensation of paint as a three dimensional substance, found in some modernist work. Paquette’s oils are often broken up into a sort of latticework, composed of paint edges and the lines of the natural forms he is painting, tree limbs, the dark spaces between rocks, or rough seams in serrated bark. He seems to find suggestions of line everywhere, even though he rarely uses line in an overt way. Frequently, the effect is the result of an under-painting, often in a complementary color, the edges of which are allowed to show; another area in which I couldn’t help but make the comparison to Garber. Paquette’s web site has examples of his oils, large and small, and his small gouache gems. A beautiful small book has been published, Thomas Paquette: Gouaches, in which the images are printed very close to the size of the original paintings. Those in the Philadelphia area may be able to catch the last couple of days of the American Arcadia show at the Gross McCleaf, which ends tomorrow. Beyond that, the Gross McCleaf is one of the galleries that represents Paquette on an ongoing basis; there in a selection of his works on their site. Paquette lives in upstate Pennsylvania, which is the location for the majority of his recent work. In addition to shows, he is also represented by galleries in Maine and Colorado. The subject matter and compositions are fairly common, but the simple twist of foggy colors makes the work very unique and incredibly peaceful. Paquette is one of my favorites, a permanent fixture in my favorite links. I saw his work a few years back and it left an impression. I saw his work at a studio in St Paul lowertown. I thought that he still taught there at his studio. Am I wrong. I met someone who was at a recent showing of artwork in Minneapolis Art A Whirl… I meant to take a class or series of classes soon. I wonder if he is still teaching in St Paul ? Who in fact, does his website, anyone know ? What a fantastic colorist artist.